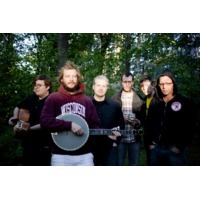 Volcano Choir are an indie band and collaboration by Justin Vernon (of Bon Iver) and Collections of Colonies of Bees. Their music combines Vernon's soft vocals with Collections of Colonies of Bees' post rock sound. Their debut album is Unmap and was released on September 22nd, 2009. It reached number 92 on the Billboard top 200 chart.